Anti-GM protesters who had planned to "decontaminate" a field of modified wheat in Hertfordshire have been stopped from entering by a police line. The Take the Flour Back group said it failed because the crop in Harpenden, created to deter aphids - a wheat pest - was "hidden behind a fortress". An order banning protesters from entering the site was issued on Friday. They say crops could contaminate the surrounding area. Site owner Rothamsted Research says that is highly unlikely. Police say that two men, who were arrested for trespassing in the banned area, are being questioned at a Hertfordshire police station. The protesters had planned to rip up the crops. "In the past, kids, grannies, and everyone in between has decontaminated GM trial sites together," Take the Flour Back's Kate Bell said. "Here at the beginning of a new resistance to this obsolete technology, we see GM hidden behind a fortress. They were never going to get through. The leaders of the action, Take the Flour Back, had acknowledged that in advance. The security presence was too overwhelming. The march reached the police and got no further. 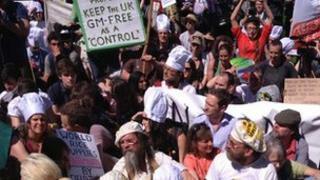 Any dreams of reaching the plot of GM wheat were dashed so the protesters sat down and chanted "no GM" instead. One woman protestor had adorned herself with the word "biodiversity" in body paint. A young man with a banner started up a siren but a police officer pointed out that this would alarm the horses so he agreed not to use it. It was that kind of event - no scuffles, no violence. And the GM trial survived. The security plan triumphed. At least for today. The challenge will be to maintain this level of protection in the weeks and months ahead. "We wanted to do the responsible thing and remove the threat of GM contamination - sadly it wasn't possible to do that effectively today." The order, enforced by police officers around the perimeters of the site, banned protesters from entering the land as well as from walking on a public footpath that runs through it. It was successfully granted to St Albans District Council after it was approved by the home secretary. Take the Flour Back said 400 protesters - made up of "growers, bakers and families from across England, Ireland, Scotland, Wales, France and Belgium" - met at nearby Rothamsted Park at midday. Police say there were up to 200 protesters. Take the Flour Back said protesters then linked arms "and walked calmly towards the site before being stopped by police lines". They sat down in front of officers for half an hour and shouted protest chants before returning to the park to continue their demonstration. Despite the two arrests, police said there were "no disturbances in the area". BBC correspondent Sophie Hutchinson said the protest at Rothamsted Park - policed by a few officers dotted around - had "the air of a festival" and featured music, singing and a number of speakers. "We feel that GM presents potential risks," protester Tom Fenton told BBC News. Media captionProtester Tom Fenton: "You can see the UK consumers don't want this." "There's uncertainty about the health effect of this - there's been no adequate long-term health safety testing." Rothamsted Research says GM is "just one tool in the toolbox to create more sustainable food". But Mr Fenton said: "When the exploration of that tool compromises the existence for organic agriculture and compromise the existence of non-GM agriculture then it's just not fair to do so." Opponents fear that, because the trial is taking place in the open air, the surrounding area could be contaminated. Professor John Pickett, a principal investigator at Rothamsted Research, told BBC News there was "a very, very remote chance that anything should get out". "All it would mean was that some other plant - if it ever did miraculously transfer into another plant - was making a smell like the aphid." He said that, using genetic modification, the pheromone for the aphid had been put into the wheat to frighten aphids away. Media captionProfessor Morris Maloney says the protesters' claims are "scientifically inaccurate"
More importantly, the pheromone also attracted other insects to attack aphids, he said. "It's crucially important, as we try to provide more food for the world, to protect our crops," he added. The crop - developed with genes from the mint plant - is due to grow until September. Speaking before the protest, St Albans District Council's executive leader, Julian Daly, said it had taken action to stop a demonstration on Rothamsted Research's land that "may put historic crop trials at risk". "Continuous trials have been under way there for over 160 years and are of international significance for the future of world farming," he added. Rothamsted has previously pleaded with anti-GM campaigners not to destroy their experimental plots.